If you rush to Starbucks at the first hint of cool weather . . . If Pumpkin Spice Latte is your fall drink of choice . . . If you need a way to recover from a busy summer and take a breath before a busy holiday season, this book is for you. Pumpkin Spice and Everything Nice Coloring Book includes gorgeous illustrations featuring your favorite images of autumn. This one-of-a-kind adult coloring book has classic fall quotes, fun sayings, and Bible verses featured alongside detailed coloring pages. 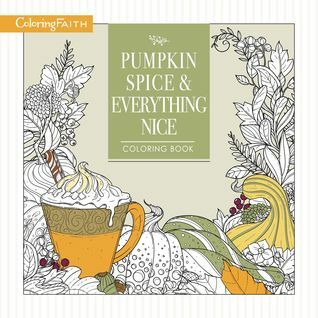 Pumpkin Spice and Everything Nice Coloring Book offers hours of enjoyment and reflection and makes the perfect gift for anyone who loves fall. So settle in by a crackling fire for an evening of relaxation, rest, and pumpkin spice! I was interested in this adult coloring book from just hearing the title alone. I love fall, love all things pumpkin spice, and find coloring very relaxing! Pumpkin Spice and Everything Nice surpassed my expectations. This is a big book (10" x 10"). The pages are thick and suitable for coloring with pencil or markers. I colored a page with markers and there was no "bleed through" on the other side of the page. The pages are also perforated so you can remove them to frame or display. The illustrations in this book are by Julianne St. Clair and her designs are really lovely. There are 90 designs to color. Some are quotes or Bible verses. There are some very intricate patterns to color and there are also some simple pages to color. I really like the variety of coloring patterns in this book, as it gives a lot of variety. The quotes and simpler designs are nice to color when time is short. My favorite quote about fall is included: "I'm so glad I live in a world where there are Octobers" (Lucy Maud Montgomery). Designs in this book include: pumpkins, fall leaves, Thanksgiving dinner, fresh baked pies, harvest corn, mittens, campfire, farm, hayride, fireplace, apples, warm mugs with cocoa (or maybe pumpkin spice latte! ), and more. As always, I find coloring to be very relaxing and pleasant. I especially enjoy coloring while listening to favorite music. 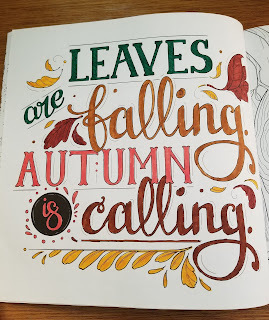 Pumpkin Spice and Everything Nice is an very well made coloring book, and I look forward to enjoying more coloring in this book through this fall! I received a copy of this book from Booklook Bloggers.